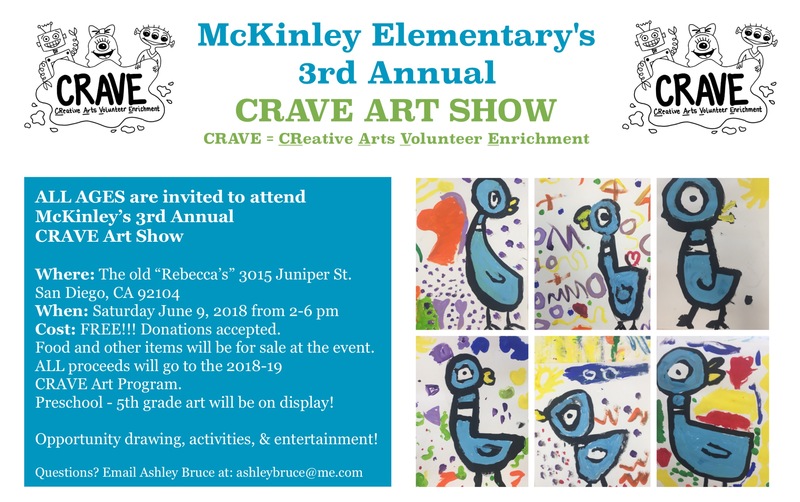 Please Join us for our 3rd Annual CRAVE Art Show on June 9th, 2018, from 2:00 – 6:00 pm. This year we have a new location for the show! 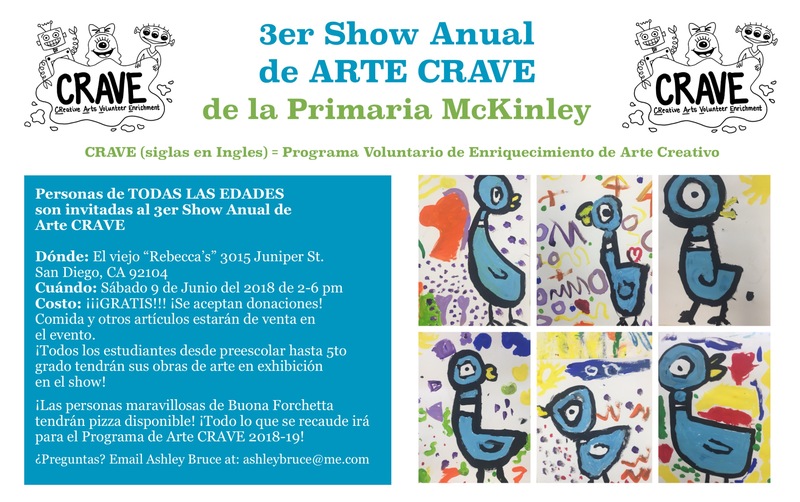 We will be transforming the corner of 30th and Juniper in North Park at the old “Rebecca’s” with art from all of our McKinley Students (3015 Juniper Street). See our flyers here: English and Spanish. Please come check out the amazing art our kiddos made this year. We will have a raffle, CRAVE T-shirts for sale, pizza from Buona Forchetta, baked goods from Hartley’s, and more. The event is free, but donations for next year’s art program are happily accepted! Bring the kiddos, bring your neighbors, bring your family! This is a very fun event, and also a very proud moment for our kids to showcase their hard work and creative talents. Note from our fearless leader: Because the space is smaller this year, we are asking for a kid free/adults only set up. I know that may be hard, but we just don’t have enough space for little bodies, and I don’t want anyone getting stepped on. Thanks for understanding! We look forward to seeing everyone for this year’s CRAVE Art Show! Thank you, also, to the surrounding businesses for donating window space to display even more art as well as donating to our raffle. We are so thankful for our supportive business community!